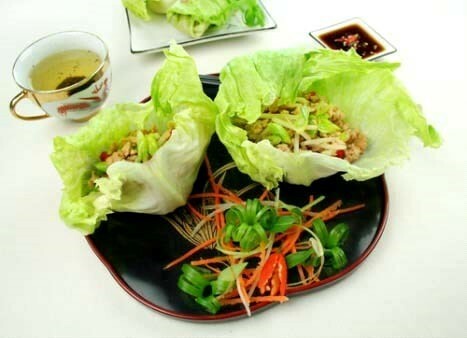 This is a classic Asian dish that is truly delicious and fits into our maintenance and healthy eating program so well. 500 grams lean pork mince. Iceberg lettuce washed & pulled apart into cup size shapes. Heat oils in a skillet on medium heat. Add garlic, ginger and shallots, cook for about 2 minutes. Add mince and stir until brown. Add capsicum, water chestnuts, soy & oyster sauce. Simmer for 3 minutes until sauce thickens. Remove from the heat, add coriander and mix through. Leave to rest for about 3-4 minutes and then stuff lettuce cups with the meat mix. Serve with chilli sauce (optional) and green tea. Serves 2 adults for dinner or 4 as lunch or snacks.